It could be argued that some of these elements exist in both games to simplify the development process. 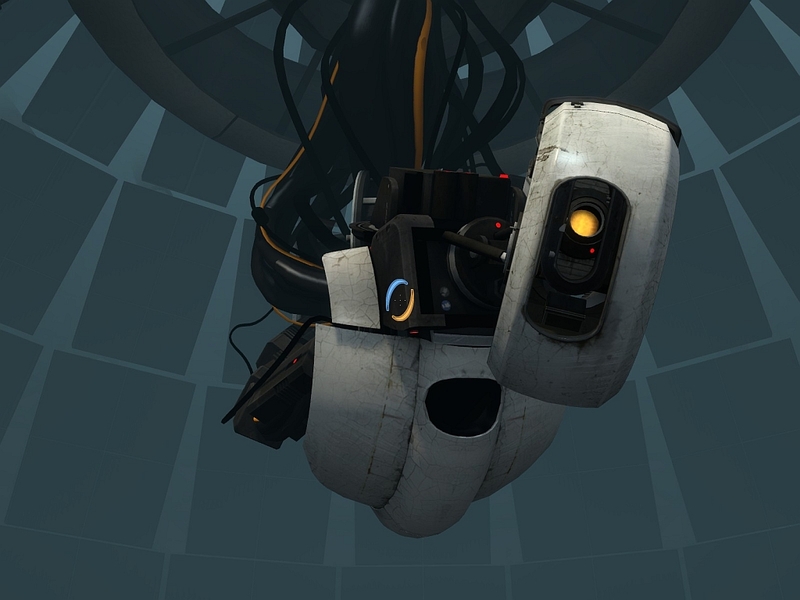 However, most of these elements were improved on and revisited in Portal 2. One thing is for certain; the more you dig, the more sinister this relationship becomes. Portal turrets would appear to fire the same ammunition as the Combine AR2 rifle. As we know, the AR2 ammo is rather compact and consolidates an entire clips worth of ammo into a single round. Specifically, the AR2 hammers the round until it is depleted. This kind of compact ammunition would be perfect for the Portal turrets. Contrary to what Cave Johnson tells us, the ammunition itself is considered to be ‘pulse’ ammo and functions utilizing dark energy. Combine shield walls (the force-fields you see around City17) are very similar to the emancipation grills in Portal 2. There are some slight differences in their behaviour though, which could imply that one of the two factions (Aperture of the Combine) modified this kind of technology to better suit their needs. For starters, the Combine variant does not destroy objects. It seems to be able to produce a shock though; this is seen in Half-Life 2 in Nova Prospekt, when Alyx attempts to rescue Eli. Alyx reaches into one of these fields and gets zapped in the process. The interesting thing about the Combine force-fields is that they will let certain people through them. The Combine have no trouble getting past them whereas Freeman has to find ways to deactivate them. How the force-fields are able to determine who to let through is a mystery. The emancipation grid also alters the portal gun, making it destroy remote portals to keep the environment secure and the tests fair. Portals cannot be shot through the grill. Aperture Science as ever, were being ironic with their naming in this case. Emancipation means ‘to free’ or ‘to liberate’; a suggestive nod to the test subjects. The only way to be freed from Aperture is to die. Fundamentally, these balls of dark energy have not changed whilst transitioning across factions. The Combine utilize them as a means of defence and power and Aperture employ them for testing. The only difference lies in their behaviour in that, Aperture energy balls tend to travel a lot slower than their Combine counterparts. Probably a modification on Aperture’s side to increase their efficiency as a testing tool. The energy balls themselves are quite self explanatory in their similarities and almost like ball lightning, it could be said that with the right ingredients they may be a natural form of energy. The ball catchers though, are another story. There are many similarities between the Combine and Aperture catchers. Aperture have adopted a more elegant design whereas the Combine catchers are very large and mechanical. In both cases, the ball catchers are used to power external devices and components. The energy pellets have a very short half-life and tend to decay in a matter of seconds. In Portal 2 we don’t see any energy pellets. We could assume that due to lack of power in the intervening years, the means to create them has been lost. LAB RAT is a comic made by Valve that was released to help tie in details between Portal 1 and Portal 2. It was released in April 2011. The comic sheds light on crazed scientist Doug Rattman and goes into detail about his involvement with Aperture. A Gravity Gun, Black Mesa Facility style Health and H.E.V Chargers and probably the most intriguing piece of equipment – the Combine Health Charger. 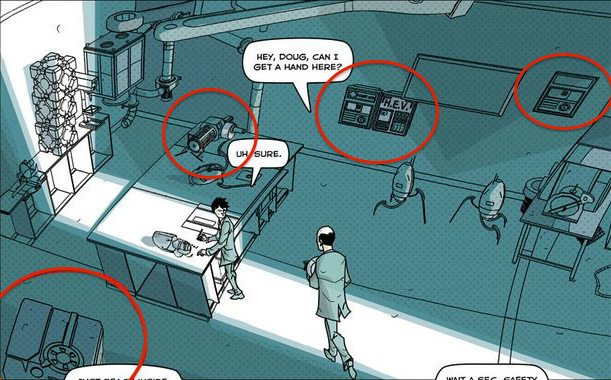 It is unknown why or how Aperture would have these devices – or if their appearance in this comic can be considered canon. As with all things Half-Life, it raises more questions than it answers. Imagine taking GLaDOS, ripping out a few personality cores here and there and finally making her submit to the control of the Combine. You’d end up with Overwatch. Knowing GLaDOS, she’d actually enjoy it. Overwatch could almost be directly compared to GLaDOS. Overwatch can issue orders to units on a whim and adapt to evolving situations. The behaviour of Overwatch could suggest a kind of digital consciousness – much like GLaDOS. It’s worth noting that the tone and dialect of the Overwatch voice is very mechanical. It would seem that even though digitized, consciousness can still be subjugated to the Combine’s will. This is briefly touched on in the Breengrub transcript and confirms that the Combine can indeed upload and replicate consciousness. There is another very important observation to be made, in Half-Life 2: Episode 2. The Overwatch voice has been altered and sounds almost exactly like GLaDOS (both are voiced by Ellen McLain too). You can listen to this variation here. We can only assume the Borealis holds the key to all of these mysterious connections. If you enjoyed this Half-Life Lore roundup, you might also like our previous article in this series ‘5 Intriguing Things BreenGrub Teaches Us About The Half-Life Saga‘. You can also keep up to date with all of our new content by following us on Twitter @LambdaGen. This is certainly interesting, but the pulse ammo/energy ball points are canonically different, as Portal 1 was made by reusing HL2 GFX and code, and to keep the art style consistent, they didn’t make them fire actual bullets in P2.